I have 25 years of experience working with kids, elite teen athletes, seniors, and everything in between. I've trained people with severe health considerations including progressive MS, glaucoma, Diabetes, Parkinson's, and amputation. I've helped dozens of people in the 40+ age group regain what they once had but lost. I truly put the personal in personal training - I program using fundamental movement patterns as the basis, but beyond that I never use the same template or program for my clients because no two clients have ever had the same challenges, needs or goals! I love every success my clients experience, from "I can see my abs!" to "my back doesn't hurt when I do gardening anymore!" but what I love the most is that moment it clicks that everything they do is easier. They feel better, sleep better, like how they look, and feel like they've regained their health! I love getting to know my clients and what motivates them, discourages them, what makes them happier and what makes them frustrated. I'm a keen observer and a dedicated coach - I do whatever it takes to find the magic sauce that is each client's ideal program! OUR AGREEMENT: I promise to help you reach your goals in a safe and effective program if you promise you're ready to make the changes necessary to achieve success! I’m so glad I started working out with Laura. I’ve never been into fitness, but turning 50 made me realize I really need to start taking care of myself. So my husband and I started with Laura. She’s amazing. I love that she works with all fitness levels. We were beginners, and she was always ready with something that gave us just the right amount of challenge. We are feeling so much stronger, and actually look forward to the workouts. (What?!) I would highly recommend Laura to anyone at any level. Don’t worry, she can be a beast for anyone who is already fit! Sign up! You won’t regret it!! Laura is exactly the trainer I’ve been looking for! I was in great shape for most of my life, but two kids and several years later, I was starting from square one. Laura understands my need for quick challenging workouts that won’t leave me shaking and destroyed! Thanks to her, my workouts are much more efficient than they used to be. She helps me modify, due to a few old injuries, and has a great sense of humor that keeps things fun. Highly recommend! I normally just work out on my own. But I tend to do the same things over and over. Everytime that I do your workouts, my legs are really sore so I know that I don't work on them enough. You have a lot of variety and make them fun. Thank you, I really have seen a huge difference. Laura Endres has been such an inspiration and excellent trainer for me these past few months. I have been following her workout program in an online format and have had such fabulous results and am feeling stronger and have more energy than I have in years. At 65, I'm looking to maintain and build muscle and strength, have energy and endurance to be and continue to be active and healthy through this next chapter of life as well as spending the minimum amount of my valuable time to do so. 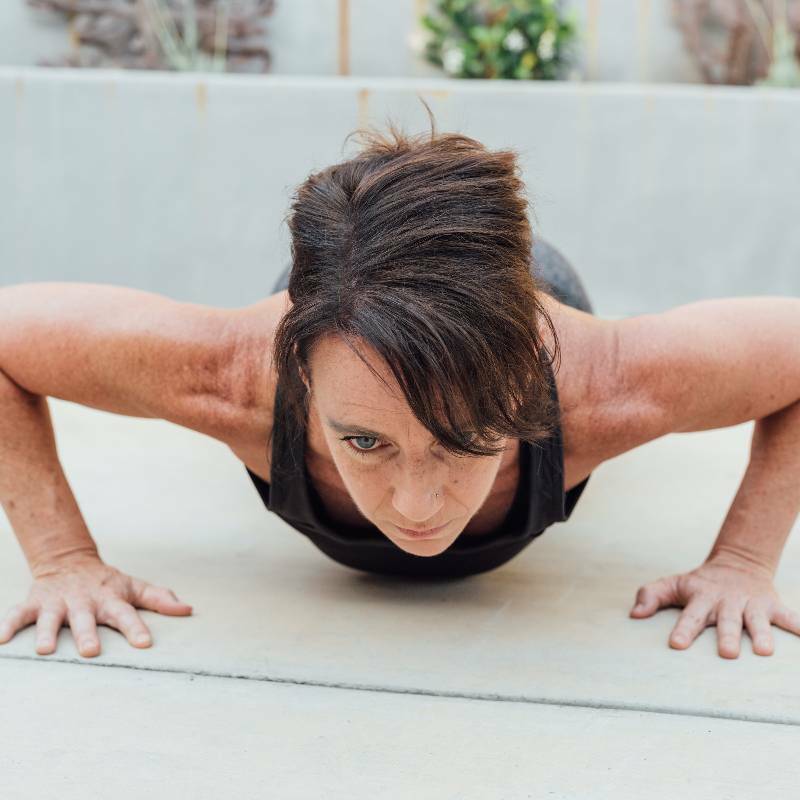 Laura's workouts are fun, as challenging as I need them to be , short and sweet and always allow for modifications that meet any of my physical limitations. She is accessible as well as encouraging while offering feedback for questions as well as solid, safe workouts that can be done at home with minimum space and equipment. I highly recommend her and look forward to continuing following her excellent workouts that are varied and have excellent videos as well as tips for healthy nutrition and lifestyle. Check her out! I'm off to do my next workout right now! I know it is the current fashion to give everyone a 5-star rating, but I do not subscribe to that trend. I think a review should be an honest assessment of one's experience so that others may make an informed decision. That said, I have had the benefit of training with Laura for about six months now & I am regularly surprised & delighted by the results. Her workouts are varied, challenging & crafted to exercise the entire body. Somehow she manages to incorporate cardio, strength training, Pilates, yoga & cool down into a single 45-minute session! I am stronger, fitter, have better balance & posture because of our training. Because of Laura, my other activities (golf, weight training, etc.) have been enhanced. I am 64 years old & have never been a fan of working out; Laura has made it almost enjoyable... She absolutely merits a 5-star rating! If you are looking for a trainer that is personal, hard-working, and catered to your needs, then you will be fortunate to have Laura Flynn Endres working with you. I have worked with Laura for the past year and I don’t know what I would have done without her. I needed someone to help spot, set goals, and challenge me, and she has exceeded my expectations. I like Laura because she listened to my needs and goals, and developed a plan specifically for them. She is extremely knowledgeable about how to target certain muscles that I needed to work on. I love that she isn’t fake, but genuinely is interested in my well-being. It is obvious that she cares about me personally and works hard to challenge me on any particular day. I can tell that she puts a lot of preparation into our workout sessions and is driven to do her best. I would highly recommend Laura if you want a skilled, personable, responsible trainer. You will be very lucky if she takes you as one of her clients; I know I am. I love how Laura varies our workouts. No two days are the same. I love how she's always on time, and always cheerful. And last of all, I love how she pushes me to do more, but also understands my limitations. You, too, will love working out with her. Laura's great - fun, motivating and knowledgable. She puts thought into her workout routines and tailors them to my needs, and they consistently feel like the right level of challenging. Highly recommend! Laura has made our tiny home feel like the only gym we'll ever need. She's wonderful to be around (even at 6:30 AM!) and listened to our goals carefully before developing a routine for us. Safety and proper form are important to us, and its clear they are a priority for her too. She checks in regularly with us. She quickly answers questions about form and nutrition, even with our specialized needs. We definitely feel like we picked the right person!